Despite largely agreeing it was time for a change, many Mansfield Town supporters were sad to see club legend Adam Murray depart as manager yesterday after just one win in 11 League Two matches and wished him all the best. Delboystag said: “A sad day, but probably the right decision. “No one wanted to see Adam lose all his credibility with the Stags fans. A very good player for the club, which made him a club legend and he should be remembered for that! “It’s always a sad day when someone loses their job, plus it’s sad that it’s come to this. “However, I do think it was the right move for the club and at the end of the day it’s all about the club, not any one individual. 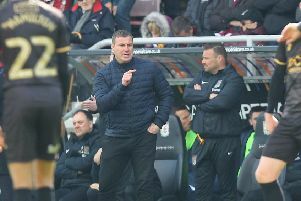 He added: “Other names that might be thrown into the ‘possible managers’ hat - Richie Barker, Russ Wilcox, Ian Baraclough, Danny Cowling (Lincoln City) Mickey Adams, James Beattie. “Let’s just hope we don’t end up with Dean Saunders. I said he was the best man for the job when those over the M1 gave him the manager’s job and he did a sterling job there - lol. “Apart from Evans & Cotterill, none of the others fill me with much hope, but time will tell. I just hope JR goes for the best, rather than the cheapest option. Bucketbanger said: “When you have to build a team without any money you are walking in a minefield picking out of what’s left over sadly it hasn’t worked. “Will a new manager have any money to spend in the transfer window? Tibbystag said: “What about Steve Cotterill - out of work since Bristol city released him? Oilybrian said: “My first post of a dissatisfied season. Adam murrays gone - who will replace him? Will it be someone who’s been sacked from his last five clubs ? A newcomer? A rubbish foreign manager ? Big Sam? Who would be a football manager? Ravostag said: “All this sadness about Adam Murray’s departure hardly squares with the attitude of many fans who could not wish to see the back of him. “Everyone knew it would end in tears, it always does. “The average life of a Division Two manager is eight months so Adam has I suppose had a fair crack of the whip. “The odds were stacked against him from the start, poor attendances, impatient fans, unrealistic expectations, modest budget etc. “The reality is we are probably one of 40 clubs with similar aspirations to make the Championship and we are in the lower 10 per cent of those teams. “We are probably where we should be based on the quality of the club both on and off the field, so in that regard Adam is no doubt unlucky, but then it is time for someone else to have a go. Back four’s view was: “So action speaks louder than words. “Inevitably a decision had to be made as results put a strain on the management team and a strain on relationships with the chairman. “Yes, football managers’ jobs can be complicated and as results proved in recent games it wasn’t going the way Adam would have liked - not for the want of trying. “Even as a player you could not faulty his commitment and endeavour. When wearing the Blue and Amber shirt his spirit and attitude also was faultless. StagSam said: “I firmly believe that these players, with the right guidance can get us out of trouble and beyond, this season, I feel I have seen enough of what they CAN do, individually. “We need someone to bring the individual talents together, with a system that gives them a chance. “Interesting that ALL the management team have gone together. Stagman1966 added: “ It’s a very sad day for Adam, and the fans that have, and always will hold him close to their hearts as a player that gave everything for the club as a player, and latterly as the manager. “Hindsight is a wonderful thing, but I think maybe Adam would possibly agree, that the Managers job came a couple of seasons too soon for him. “Adam will always be remembered as the Captain Fantastic that dragged Paul Cox’s team kicking and screaming back into the Football League, and for that, we should be happy to always welcome him back to Field Mill, either with a visiting club, or socially to enjoy a pint or two watching a game.